The Trampantzeion High School of Siatista is among the oldest high schools of Greece. After its recent renovation, the traditional stone building now serves as an educational center, housing the Historical Paleontological Collection of Siatista and the Center of Environmental Education of Voion Municipality. This historic building will serve as a focal point for conference activities to be attended by participants and by local supporters of paleontology. The High School will host an extended poster session and the Conference Opening Ceremony. See below for a map of Siatista, showing the conference venues, accommodation places and suggested points of interest. The modern Cultural Center of Grevena is situated very close to the commercial center of the town of Grevena and near several touristic attractions of the area. 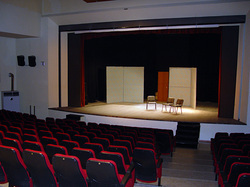 The Center provides all modern facilities for the oral presentations including up-to-date audiovisual systems, a big screen and a seating capacity for an audience of 300. The Cultural Center will host oral presentations and the Conference Closing Ceremony.